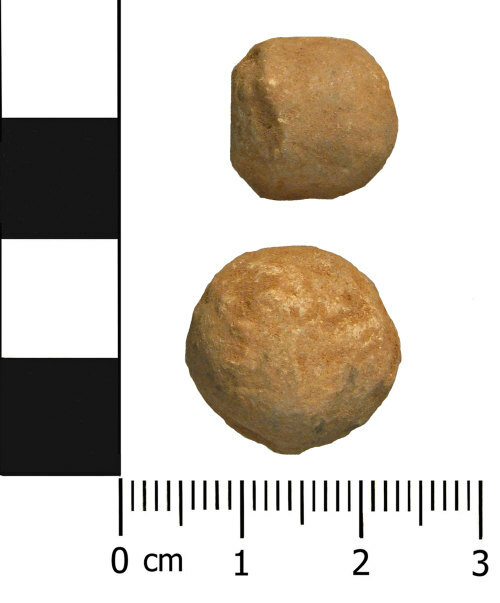 Two lead alloy shots, one probably from a Carbine and one from a Pistol of Post Medieval dating circa AD 1600-1800. 1. This shot is probably for a Carbine and is spherical in form. Carbine shots usually weigh between 16 - 23 grams. It is light cream coloured with an uneven surface patina. Abrasion, caused by movement whilst within the plough soil, has resulted in the loss of some of the original surface. It has a diameter of 16 mm and weighs 21.7 grams. 2. This lead shot is broadly spherical in shape. The shot is likely from a Pistol, which usually weigh between 7-16 grams. It has a cream colour with an uneven surface patina. It has been flattened on one side. Suggesting it has been fired. Abrasion, caused by movement whilst within the plough soil, has resulted in the loss of some of the original surface. It has a diameter of 13.21 mm and weighs 12.5 grams. Harding, D.F. (2012) Lead Shot of the English Civil War: a Radical Study.London, Foresight Books.